Most collections of London pictures concentrate on the well known tourist attractions. This one sets out to show the whole range of London buildings, both the exceptional and the typical, including industrial, commercial, domestic and other types of buildings. The pictures in the 'Buildings of London' section of this site were mainly taken from 1986 to 1998, although I hope to add some more recent pictures. 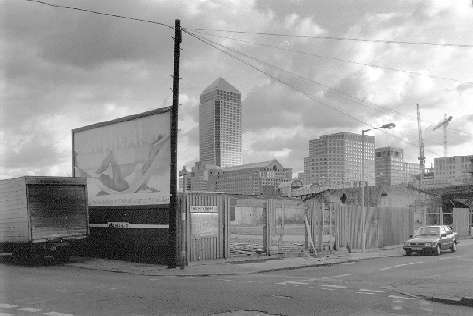 Work mainly from before 1986 involving industrial or commercial property is on my 'London's Industrial Heritage' site, which includes pictures in many now redeveloped areas of London including Bermondsey, Limehouse, Deptford and Wapping, as well as work from boroughs other than Greenwich, Southwark and Tower Hamlets. Other work on this site includes series on the River Thames, from Staines through Battersea and Westminster to docklands and the Thames estuary. Croydon Tramlink looks at the tram line and its surroundings. Ideal Cafe, Cool Blondes and Paradise is a three part sequence of colour images taken on London streets. Finsbury Park shows some of my panoramic work, which really needs a web site of its own. There are also links to pictures taken at many events in London, such as the Notting Hill Carnival, Gay Pride, Jubilee 2000 and the first Countryside rally. More recently much of my work in London, including many pictures of events and demonstrations, gets included - sometimes shortly after the event - in My London Diary. Although this site is centred on London, a few other pictures do creep in. German Indications combines images and text related to my visits to an area of north Germany. The More on the work page includes links to other work outside London. Copies of all pictures on this site are available for reproduction or sale and your comments are welcome. All photographs © Peter Marshall - contact me about any proposed use. Download images 24/7 from Alamy - a leading portal for both general and specialist images. External links to my work - photographs, text etc. Your search may find some pages which are part of a framed section of the site - which will be displayed outside of their normal frame. You should also search MyLondonDiary which has various pictures of places and events in London from 1999 on. The Google search below does not usually cover the whole of the site, so if you don't find what you want you should use the link to go there and search. For work from the the 1970s and 1980s showing industrial sites - including riverside warehouses in Bermondsey and Wapping and many other places along the Thames on the 'London's Industrial Heritage'.site, go directly to the site, and use the built in search facility there.